Seaton Burn Waggonway - Suscram. 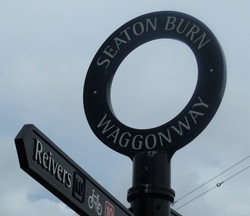 The Seaton Burn Wagonway runs on an east-west course through Burradon and Camperdown. It was not originally connected to, or for the use of, Burradon colliery - this had its own wagonway for transporting coals to the Tyne - but had a major impact on the landscape of the two settlements. Originally it was known as the Brunton-Shields Railway, having been built by the Grand Allies in stages (1826 and 1837) from Brunton Colliery to the staiths on the Tyne between Wallsend and North Shields. The Wagonway proved to be a boon to the ever increasing number of collieries that were in its vicinity. They would join on to the line saving them the expense and logistical problems of constructing their own wagonway. The last colliery to connect to the line was Seaton Burn in 1837, which was owned by the Grand Allies. In 1878 a change of ownership of the line occurred and the Brunton-Shields railway finally became known as the Seaton Burn Wagonway. At a later date the line was connected to the Blyth and Tyne railway via a line running towards Backworth. In 1920 the Blyth and Tyne line had been taken over by the North Eastern Railway. By the date of the 3rd edition Ordnance Survey (c.1915) Hill Head engine house was already marked as disused.